Struvite stones are a common health issue in certain breeds of dogs and cats. The good news is that they have a good prognosis. This is contrary to the other common urinary crystals that are difficult to treat: calcium oxalate stones. The crystals proliferate in the bladder and kidneys causing pain on urination. A urinalysis will identify their presence. Due to the pain, a dog or cat may decide not to urinate or hide in a corner. Often, a urinary tract infection is what precedes the crystal formation. When first diagnosed, your pet may require a prescription for antibiotics to clear it up. The good news is that struvites dissolve in acidic urine (urine with a pH<7.0). And, their formation can be prevented by keeping the urine in the acidic range. Prescription pet food diets aid in keeping the urine in the acidic range and include salt to encourage drinking of water. Dogs should be encouraged to urinate frequently. Pets who spend prolonged time waiting for someone to let them out are setting themselves up for a urinary tract infection. Below is a basic list of foods that will acidify the dog's urine. There are others, but we picked out the most common that are typically found in dog food and dog treats. My vet has placed my dog on Hills Prescription Diet. The first two ingredients are "whole grain corn" and "whole grain wheat". It also has salt to make the dog drink water. 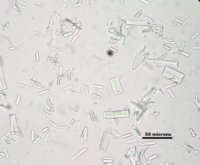 Click for a dog treat recipe to help acidify urine: struvite crystals.